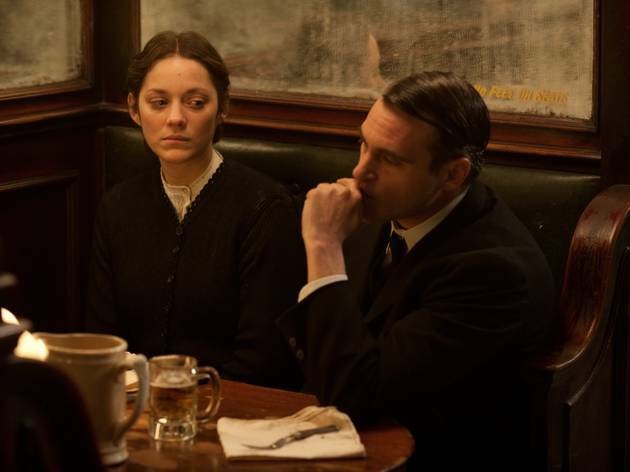 James Gray devastates with his slow-build period melodrama. Lady Liberty's back is turned. Far from the beacon of hope that so many movies present her as, the torch-bearing statue that graces New York harbor as an icon of American promise is a coldly distant presence in the first shot of James Gray's terrific 1920s melodrama The Immigrants. The message is clear: Once the huddled masses get beyond the New World's shining symbol—past this figurehead of hope and betterment—then what? For Ewa Cybulski (Marion Cotillard), a Polish immigrant traveling to the United States with her tubercular sister in tow, it means a purgatorial stopover. Immediately upon arrival, her sibling is detained at Ellis Island, confined to a sick ward to face eventual deportation. Ewa likewise is denied entry into Manhattan, and it's only through the deceptively good graces of low-rent burlesque purveyor Bruno Weiss (Joaquin Phoenix) that she finds herself in the big city, with golden-tongued promises from her new acquaintance that he'll pull strings to get her sister released. The gentleman isn't all he says he is, of course, and you can see that in the amateurish way he carnival-barks from stage, hammily introducing the scantily-clad women—outfitted as sexualized parodies of Middle Eastern and Oriental princesses—who he pimps out after each performance to the highest bidder. He has no rhythm, no presence; it seems like his lumpy suit is swallowing him whole. Phoenix initially appears uncomfortable in the role, but as this indelible, impeccably-made movie goes on, it becomes apparent that he's laying the same subtle groundwork as in his prior two collaborations with Gray, We Own the Night (2007) and Two Lovers (2008). Bruno is a hopelessly uncharismatic schlub—an initially opaque character who gains tragic depths the more his life spirals out of control—which is part of the reason he's so taken with the ethereal Ewa. 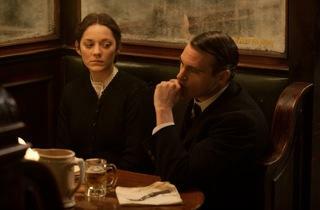 Cotillard gives a true star's performance in a role that seems informed by one of Lillian Gish's tortured lambs. She works in a parallel register to Phoenix, complementing his Method introspection with a ready-for-my-close-up iconicity that finds its fullest expression in a stunning sequence where Ewa professes her sins in a church confessional while Bruno eavesdrops nearby. Ewa has the aura of savior and martyr, while at the same time being fully flesh and blood. Her life is informed by the need to reunite with her sister; the more ephemeral American dream can wait, if it is indeed even worth striving for. (What do we have in this life, finally, beyond our tenuous connections to the people we love?) It's also telling that Gray and his late cowriter, Ric Menello, have made the third point in the film's intimate, character-driven triangle, Jeremy Renner's alluring Orlando, a magician. He's everything Bruno isn't—charismatic, agile, brimming with it'll-all-work-out conviction—yet has just enough of the sleight-of-hand huckster about him that his own assurances to Ewa about a promised land journey West never seem guaranteed. As with much in this country of ours, we want to believe, but can we? I often found myself second-guessing the film, questioning how, and if, it would all come together, even as all the elements casually, masterfully accumulated and coalesced, building to as pure a powerhouse of a climax as I've ever experienced. I won't soon forget the storm of emotion that overcame me upon the film's sublime final fade-out: The shock of the old made new, a miracle achieved, a great movie rising before me—like a delusion, like a dream.